The National Judicial Council on Friday rejected the suggestion by the Nigerian Bar Association to suspend serving judges who were among the seven arrested by the Department of State Service between October 8 and 9. The NJC, in a statement by its Acting Director, Information, said it had no powers to suspend serving judges without investigating a petition accusing the affected judges of certain acts of misconduct. It said lawyers who were part of the members of the NJC participated in the emergency meeting of the NJC where the raid on the houses of and the arrest of judges were condemned. The NBA President, Mr. Abubakar Mahmoud (SAN), made the call on Thursday in Abauja at the valedictory court session held in honour of a retiring Justice of the Court of Appeal, Justice Sotonye Denton-West. Mahmoud said at the event, “We therefore strongly recommend that, without prejudice to the innocence or otherwise of the Judges involved in the ongoing investigations, they should recuse themselves from further judicial functions or required to proceed on compulsory leave until their innocence is fully and completely established or until the conclusion of all judicial or disciplinary proceedings”. But reacting to NBA’s stance on Friday, the NJC said acting in line with NBA’s suggestion would amount to violation of section 158 of the Constitution. 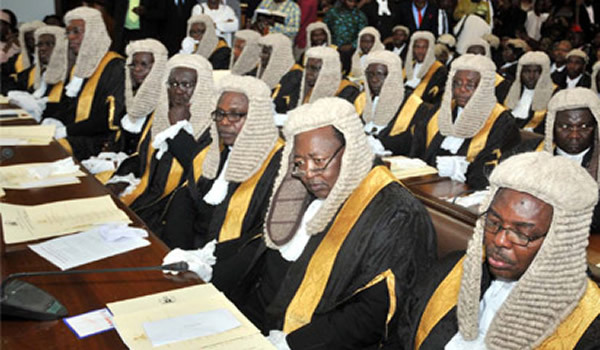 The statement read in part, “‎Thus, the current position of the Nigerian Bar Association vis-à-vis its recommendation that the affected judicial officers involved in the on-going investigation of Judicial Officers by the DSS, be requested to proceed on compulsory leave until the conclusion of all disciplinary proceedings against them, is unacceptable to the NJC; as it breaches the 2014 Revised Judicial Discipline Regulations formulated by NJC pursuant to Section 160 of the 1999 Constitution of the Federal Republic of Nigeria, as amended.